Apparently, the warm weather we are currently experiencing is not common for this time of year but we are not complaining! We took the opportunity of blue skies and temperatures in the 20s to continue to tick off our maintenance list. Liz replaced the motor on the anchor windlass so that we won’t have to pull up the anchor by hand. We had enjoyed doing it as it gave us exercise and it wasn’t too bad with the right technique. However, we did recognise that in strong winds we might need some help! Liz also replaced the zips on our spray hood so that we can completely enclose the cockpit in bad weather. This is very useful when at anchor or in a marina as it gives you an extra room. Jo polished all the chrome on the boat as it had become stained and starting to show signs of corrosion having been subjected to months of sea water crossing the decks. 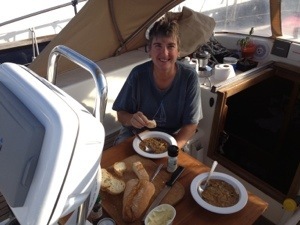 We still had time to stop for lunch in the sunshine to have fresh bread and homemade soup. I will have you know that I lifted the anchor on at least two occasions over the last 6 months!! !